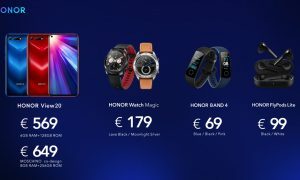 Honor has launched the Honor Watch Magic and Honor Band 4 Running Edition in India. The two devices come with 5ATM water resistance as well. The Honor Watch Magic comes with 5ATM water resistance certification which means it can survive submersion of up to 50 meters. The smartwatch is just 11mm thin, and sports a 1.2-inch HD AMOLED touchscreen display with 390×390 pixels resolution. It includes 24-hour real-time heart rate monitoring, swim stroke recognition, scientific sleep mode, call reminders, altitude barometer, pressure monitor, various sports modes like smart running, and customizable watch faces. It comes with GPS, GLONASS, barometer, and NFC support. The smartwatch packs a 178mAh battery, and the company claims that it lasts up to 7-days of easy daily use. Instead of running WearOS, the Honor Watch Magic runs its own operating system. The smartwatch supports both Android (4.4 or above) and iOS (9 or later) devices using Bluetooth 4.2 LE. To recall, the Honor Watch Magic was launched in China in November last year. Honor Band 4 Running Edition sports a PMOLED display. It also does not house a heart rate sensor and NFC support. It is fuelled by a smaller 77mAh battery with up to 12 days of working time. The Honor Band 4 Running Edition comes with a 6-axis sensor that offers improved running detection by measuring cadence, step length, ground contact time, foot strike pattern, landing impact, eversion excursion, and swing angle. It is water resistant up to 50 meters, measures 40.5×14.8×11.2mm, and weighs 6 grams. 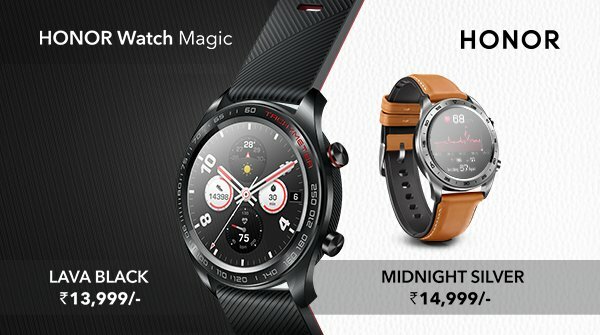 The Honor Watch Magic is priced at Rs. 13,999 for the Lava Black sports variant and Rs. 14,999 for the Moonlight Silver variant. The smartwatch will be available exclusively on Amazon India. 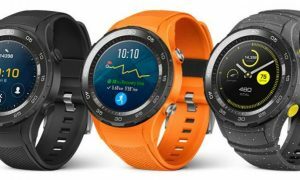 The Honor Band 4 Running Edition, on the other hand, is priced in India at Rs. 1,599 and this wearable will also be available on Amazon India exclusively. It comes in Lava Red and Green color options.